Our Kids’ Party Entertainers in London are a team of professional Magicians, Clowns, Face Painters, Children Expert Entertainers, Balloon Modelers, Puppeteers and amazing Storytellers dedicated to make of your child’s birthday party the most enjoyable experience he/she has ever had. We make sure that every Entertainer attending your party comes prepared with the most suitable high energy games, the most modern and best music hits children just love, incredible costumes, mouth-opening magic shows, creative face painting, interactive storytelling, and many surprises that will keep children and adults mesmerized! Our Kids’ Party Entertainers will go anywhere in the Greater London Area, North or South, East or West. They can adapt to any venue you wish because they have a wide range of activities that can be performed the same in huge Halls than in your own living room. There isn’t an event too big or a party too small, for us every entertainment is special in its own particular way and we look at the advantages of each situation and use them to improve the quality of our work. All of our Kids’ Party Entertainers for the London area are carefully selected after an audition period and are then trained to keep up with the quality we offer. They are CRB checked and are proud of what they do! They take children’s entertainment seriously, always updating through the internet, courses, and meeting with other entertainers to share games, activities and experiences. Our London Party Entertainers have in mind that the STAR of the party is the birthday boy/girl and the guests. We are only the means of ensuring that the STARS have the greatest time ever! And we are also talking about the parents and the other guests in the party. Our Entertainers make everyone take part on the action and enjoy every letter in P A R T Y! Our entertainers are dynamic and multi-skilled. Our packages offer a great variety of activities combined to give you more value for the price. We have professional entertainers with specialties in every area of the entertainment business. We have LOTS of years of experience entertaining parties. We are flexible and can adapt to the specific needs of your event. We know how to inspire the children to have fun! We offer personal customer service and expert advice to make of your party the event you want it to be. Kid’s Party Entertainers in London are awesome! You can start calling or contact to book an entertainer or enquire for our packages to ensure we have a space for your upcoming event! 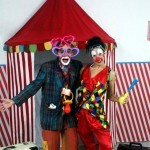 Make sure your guests enjoy by hiring our magicians, clowns, pirates, princesses, puppeteers, entertainers, and more. 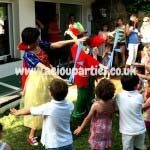 Contact us for a free non-obligatory quote, and Welcome to AEIOU – Kids’ Party Entertainers in London!